For some strange reason we weren’t invited to test drive the iPad early. But easy-to-get stories are never fun anyway. And there has always been another way to spend time with the iPad other than a freebie loaner from apple – the third party developers. Scores of developers have had iPad’s for weeks now. They’ve had to sign non-disclosure agreements, and have the iPad locked in a separate room that random employees couldn’t access. And even that wasn’t enough. The iPads are literally chained to the desk with steel cable and a lock. Apple comes by the office with a suitcase, installs the iPad in a bolted case, chains it to the desk and locks it there. And they they do occasional surprise visits just to make sure it’s still there. What’s more, Apple has told developers that they are monitoring the location of the device as well. We tried (oh how we tried) to find a way to break into a company that had one and just steal the whole desk that it was chained to to bring it back here and wait for Apple or the police or whoever to show up. It would have made an excellent April Fools joke. But CEO Heather vetoed the idea. 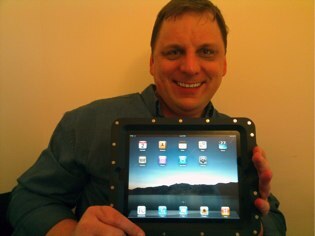 But one thing I have had the chance to do is test iPads at developers who’ve been willing to bend the rules a little. Well, actually, a lot. This is exactly what Apple didn’t want – bloggers and other outsiders to get access to and play with the devices. But play I did. I’ve surfed the net on the iPad. I’ve played games on the iPad. And I’ve done email on the iPad. Yes, those iPads were chained to desks and in a bolted on steel case. And even so, the experience was stunning. It’s a nearly flawless device. And the iPad beats even my most optimistic expectations. This is a new category of device. But it also will replace laptops for many people. It does basic computer stuff, like email and web surfing, very well. Applications load quickly and are very responsive – think iPhone 3GS with a 50% speed boost. That’s what surprised me the most. The iPad isn’t just for couch computing when you want to look something up on Wikipedia or send a quick email. It’s a perfectly usable business device. And the form factor just happens to work far better for cramped places like airplanes than a normal laptop. I doubt I’ll ever open a laptop on a plane again after tomorrow. I am easily able to type 50 words per minute on the large virtual keyboard. A physical keyboard is a nice add on when I’m in my office or hotel room, but it works just fine without it, too. The iPad will put significant pressure on laptop sales, particularly second device laptops. And it will also have a devastating effect on single-use devices like the Kindle, unless the price of those devices drops substantially. I will quite happily read books on the iPad, and the battery really does last for up to ten hours. And then there are the apps. Some of the iPads best uses are yet to be imagined. This is certainly an amazing game device and productivity tool. And I’ll happily consume massive amounts of music and video content on the iPad. Third party apps, and there are a ton of them coming, will make this even more useful. I suspect I’ll rarely be away from this device. In fact it will make my phone far less important for non-calling uses. I may not have the iPad in my pocket with my phone, but it will certainly be in my bag over my shoulder. With a 3G data plan I’ll use it to read the news, look up movie times and reviews, send instant messages and emails, and lots of other things that I do with my phone. I’m not so sure I need to have the latest and greatest phone device any more, knowing that there’s an iPad within reach. I’d pay $1,000 for a chained to the desk iPad. The fact that tomorrow I’ll get the one I pre-ordered for just $500, chain free, makes me very happy indeed.